Enjoy the taste of freshly picked carrots at any time of the year by preserving the surplus crop. Freezing is one of the easiest and cheapest methods of home preservation and requires little expensive equipment. However, before vegetables can be frozen, they require blanching, a process of quickly heating and chilling them to destroy the enzymes that cause food decay. Traditionally done using pans of boiling and iced water, it can be messy, steamy and can use large amounts of energy to keep the water boiling. Prepare small quantities of vegetables and avoid the mess by blanching them in your microwave. Fill the bowl half full of water and add several handfuls of ice. Place 1/2 cup water into the microwave-safe casserole dish. Peel the carrots and cut them into sticks or 1/4-inch cubes. Place up to 2 cups prepared carrots into the casserole dish and cover with the lid. Place the dish into the microwave oven and heat it, at full power, for 2.5 minutes. Check the vegetables to see if they are all uniformly brightly colored. If they are not, stir them, replace the cover and heat for another 2.5 minutes. 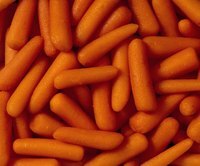 Remove the carrots from the dish using a slotted spoon and place them immediately into the iced water. Stir them gently then allow them to chill for 5 minutes. Pour the carrots into the colander and drain them very well. Repeat the blanching process until all the carrots have been processed. Put the blanched carrots into freezer bags, leaving 1/2 inch headroom. Squeeze the air from the bag and tie securely. Place the bag into the freezer. Prepared carrots can be enjoyed for up to eight months when maintained at 0 degrees Fahrenheit.